vowel.axs - 3 bandpass filters in parallel, tuned to specific frequencies in order to emulate vowels. Formant dial (and inlet) morphs between various vowels. The other parameters enable further tweaking of filter. Sounds quite nice and is fairly light (6% dsp load). Various math functions fitted to polynomial expansions and put inside a 16bit sdram table object. Size parameter determines how many samples are stored into the table. slicer i.axo like the previous, but with intlet controls for parameters. mandelbrot.osc - Oscillator based on the mandelbrot fractal iteration. Check below for info. fibonacci.axo Fibonacci sequencer. Every time trig is activated, the sequencer goes one cycle forward. At every cycle the output is calculated with the formula o=i1+i2, where i2 is the first preceding output, and i1 is the second preceding output. At reset i1=0 , i2=1 unless i1 and i2 are connected. For example, the normal sequence is 1, 1 , 2 , 3, 5, 8, 13, 21, 34, 55, etc..
fibonacci astarb.axo A variation on the fibonacci sequencer. In this case the output is calculated with o=i1*i2, and the default starting i1 and i2 are 1 and 2. Grows very quickly. pseudo factorial.axo Another variation on the fibonacci sequencer. In this case the output is calculated with o=i*(i+a+1) , where i is the preceding output. a is provided with inlet_a . At reset if inlet_i0 is disconnected, i=1, otherwise i=inlet_i0. Grows really quickly, may result in overflowing and therefore unexpected big numbers. 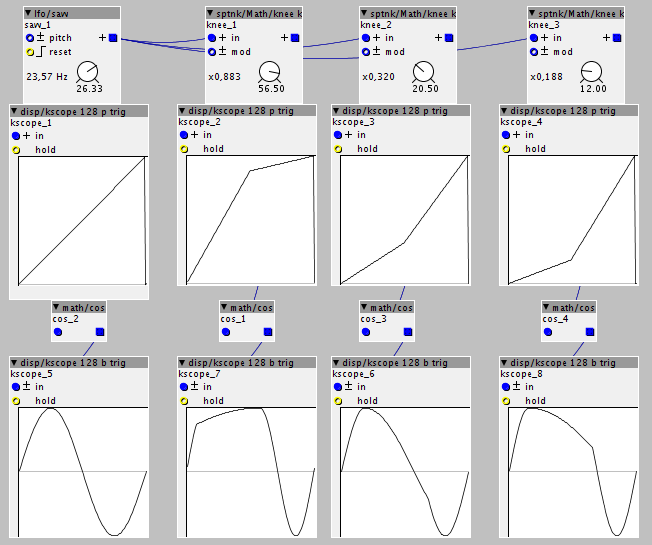 euclid.axo Euclidean rhythm generator. Chainable. Notes specifics the number of active steps, rests the number of rests. Inlet in specifics what step to read, like sel i 16/32 or disp/ibar . If outside the range the default inlet will be outputted (like said objects). Dynamic algorithm, 10% dsp load worst case with 63 notes and 64 rests. euclid length.axo Like the prevous, but this time you won't have to fiddle with rests: you just have to specify the length of the pattern (also if you set more steps than the pattern length the sequence will be calculated on the max length. chorder.axo Stores 8 chords in memory. See the post below for more informations, this is quite a fat object! 24ppq to bpm.axo This object can be used to detect the bpm speed of a midi clock signal expressed in 24ppq. 24ppq to phase64.axo This object generates a phase signal that goes from 0 to 64 in 64 beats (16 quarters) when fed with a 24ppq signal. 24ppq to pos Converts a 24ppq counter signal into different subdivisions: quarters, sixteenths and triplet eights. Length parameter can be used to set the length (in quarters) before resetting the counter (works exactly like divremc). Cue parameter offsets the incoming signal by a constant number of ppqs. 24ppqrem outputs the cued and divided 24ppq signal. clock out dual Midi clock master, also outputs Midi clock, start, stop, and continue messages on two separate Midi devices. The secondary device can be switched on or off (when off, the behavior is identical to the midi/out/clock by Johannes). Based on midi/out/clock by Johannes Taelman. Unipolar input and output, mod input. Could be useful for asymmetric distortions (see in the picture what happens when you feed a "bent" signal into a math/cos.) useful also for peculiar envelope or lfo shapes, or windows, or phase distortion applications. combinator s.axo Perform a bitwise operation between two signals. Added fibonacci, fibonacci a*b and fibonacci factorial sequencers. 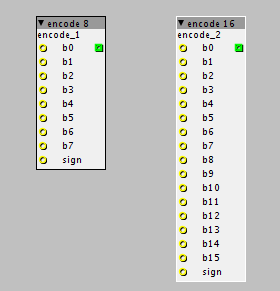 Added encode 8 and encode 16. Stores 8 chords in memory. Maximum chord size: 8 notes (lower notes have higher priority). 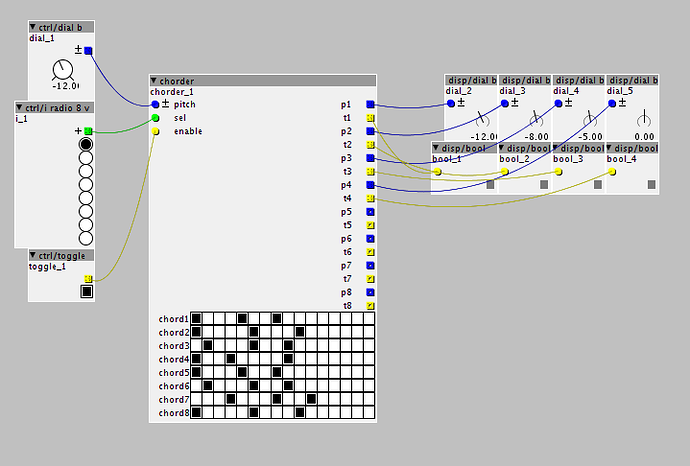 sel -> chord selector (input must go from 0 to 7, otherwise nothing will be outputted. enable -> acts like a master note on. If not enabled all output triggers are set to 0. If enabled, the triggers corresponding to active notes will output 1.
p1, p2, .. p8 -> output the pitch cv for the corresponding note. Only active notes will be changed, the others will remain to the previous state. correspond to semitones. If, for example you want to build a major chord on the root note, you'll have to check 1,4 and 7. If you want to build a sus2 chord 1,3 and 7. You can figure out the rest. Compares two k-rate signals after multiplying them for a constant (gain1 and gain 2) and offsetting them by another constant (offset). There are two outputs (normal and inverted) and a disp/bool integrated in the object for visual reference. Thank you for your contributions! 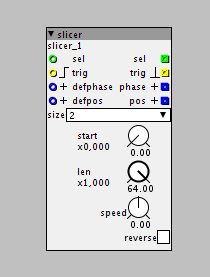 Do you have an example patch of the euclidean sequencer in use? doepfer 167 has a cv out .......maybe you could update ? Also i added a few objects, mainly in math category, tomorrow i'll write something about them. This set of objects work sorta like a double comparator, they output 1 if the input falls inside some range and 0 otherwise. sample and hold.axo An audio rate sample and hold module, completely integrated in only one module. Sample time is adjustable via parameter and inlet, linear frequency scale. There's an additional parameter that modulates (both in a positive and negative way) the hold time based on the current sample amplitude. This object does not model faithfully the actual function, which has an extreme dynamic range, but it tries to "tame the beast" and make it somewhat usable for sound generation purposes. Neither the parameters map exactly 1 to 1 the points of the complex plane, they're scaled differently. limit : the size of the bailout window. 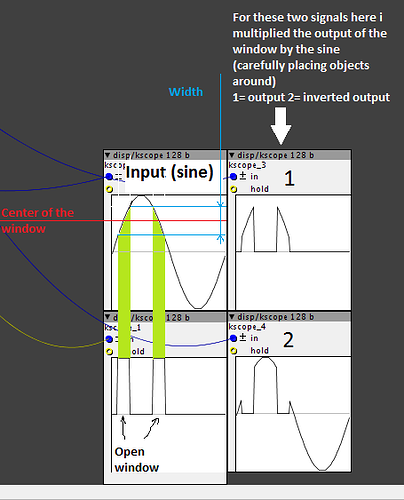 Basically, any iteration that escapes from this window will reset the oscillator to 0. 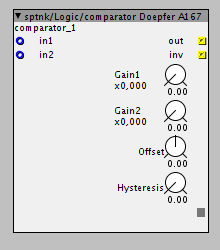 This parameter also adjusts the output gain of the osc. If a complex number does not produce any sound you might try changing this number. autoadjust : try to pitch the oscillator correctly (this won't work properly if the current iteration does not diverge. interp: interpolate between two consecutive values. This object is to be used in conjunction with table/read objects. It produces two ramp signals (phase can be fed inside a window object, pos can go into a conv/interp and then into table/read interp to enable playback), and is easily chainable. The object is programmed to play the sample at the correct speed, based on the size of the sample (hence the size menu). You can specify the start position and the (relative) length of the slice. Speed allows to tune the sample playback speed (not chromatically, unfortunately), reverse enables reversed playback. 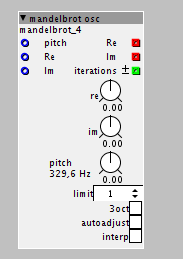 In case you want to chain several object, you can select the sample to play by feeding an integer (0, 1, 2 ...) inside sel inlet. I've added the modified slicer i.axo object, which uses inlets instead of parameters. A saturator distortion based on dist/soft and filter/lp1 - hp1 by Johannes Taelman. A soft saturator is cascaded with a filter (lowpass or highpass). You can feed the output of the filter back into the input with the feed knob and change the filter cutoff with the filter knob. postfilter allows you to pick up the sound after filtering; highpass changes the filter from lowpass to highpass. First instance of a melody generator, based on euclidean rhytms. This object requires a Ph.D in aerospace engineering for basic operation. 3 levels of velocity are outputted, corresponding to the 3 accent levels (strong, medium and weak). Velocity output can be used also as a gate/trigger output for envelopes. Cue: adds a constant number to the 24ppq signal before processing it, useful to fine-sync the object. oddBypass: skip all the odd beats during the euclidean subdivision. activenotes: set the number of notes for the melody (this will also change the rhythm, since it operates on the euclidean subdivision. This last part will be improved over time. You can write your own algorithm, just put it in local data in the calculatepitch function. First instance of a melody generator, based on euclidean rhytms.This object requires a Ph.D in aerospace engineering for basic operation. another 808-style kick drum. Independent control for amp and pitch envelope and initial phase (in order to add an initial click. Very similar to granular player 1, but with a slightly cheaper internal envelope implementation. This allows for more grains to be played (max number now set to 64).